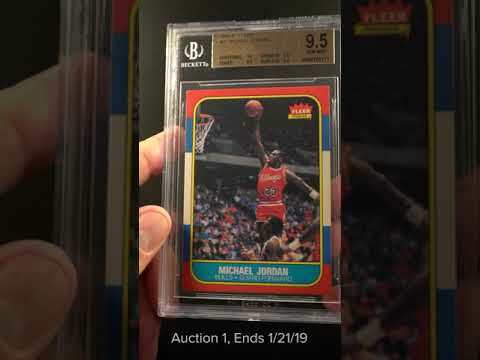 Absolutely stunning '86 Fleer Basketball Michael Jordan rookie up for bid this month. The offered beauty easily ranks among the best Beckett 9.5s we've brokered in recent months with highly impressive sub-grades showing. Uncirculated eye appeal with pristine centering, untouched corners and flawless edges. The surfaces are immaculate with bright color, wonderful clarity and zero excess print. There simply aren't enough of these extraordinary copies to satisfy the demand. Magnificent examples such as this card represent one of the best investment cards in the hobby and command serious attention. Comes highly recommended by PWCC. One of over 16,000 cards, lots and sets up for bid in our 1st Auction of 2019. Click on the link above to view the other PWCC auction lots.